On Monday, October 10, the Law and Order Committee of the Navajo Nation Council voted unanimously against legislation that would allow the proposed Grand Canyon Escalade tramway resort to move forward. The project would ferry up to 10,000 people per day to the bottom of the Grand Canyon, where the Colorado and Little Colorado rivers merge. It’s the first of four committee reviews before a final vote. The bill will now go before the Resources and Development Committee, most likely in late October 2016. While the committee disapproval is a setback, Escalade developers are pushing for approval with everything they’ve got. According to the legislative rules of the Navajo Nation, approval of the controversial bill for the rim resort and tramway into the Grand Canyon cannot be halted in committee and must proceed through three more committees: the Resources and Development, Budget and Finance, and Naa'bik'iyati' committees, before being voted on by the entire Navajo Nation Council during its next legislative session in late January 2017. Monday’s committee hearing attracted a large audience of Escalade opponents including members of Save the Confluence, the chairman of the Hopi Tribe, and his constituents. After an hour-long presentation by an Escalade partner, committee members began to question many aspects of the deeply flawed legislation. Some of the issues committee members raised included the developers’ failure to get permission from Navajo grazing permit holders to access and develop the site, as required by Navajo law. Council Delegate Otto Tso, representing the nearby community of Tuba City, asked whether the Navajo Nation would need to exercise eminent domain to remove local ranchers from the area. Nearly two dozen of those grazing permittees, who oppose the development, attended the hearing. Council members also objected to the $65 million that the legislation would require the Navajo Nation to spend to build an access road and other infrastructure needed to develop the remote site. Delegates agreed that the money would be better spent elsewhere to meet more pressing needs. They also noted that the bill “didn’t have the support of the Navajo Nation’s Division of Economic Development, Justice Department, or Historic Preservation Department advisors,” as reported in the Arizona Daily Sun. Delegate Tso also said that he opposes any development at the sacred confluence, stating, “Some areas on the nation should not be developed. Where the two rivers meet is one of them.” In support of this position, Council Delegate Nathaniel Brown, who is not a member of the committee, testified against allowing outside developers to desecrate a “home to Diné deities.” He read into the record a position statement from the Navajo Historic Preservation Department’s Hataalii Advisory Council, composed of highly regarded medicine men and women. The statement explained that the “rim top development, and walkway development would…pose detrimental irreversible harm to the sacred qualities” of the confluence area. It went on to say that development at the confluence would degrade the spiritual experience of traditional Navajos who visit the area to conduct offerings or prayers. Shortly thereafter, the Law and Order Committee voted down the legislation, electing not to hear testimony from Escalade opponents before making its decision. “We're excited to know our elected officials are listening and willing to speak up for the families, for the people, and for the culture,” said Renae Yellowhorse of the Save the Confluence coalition. 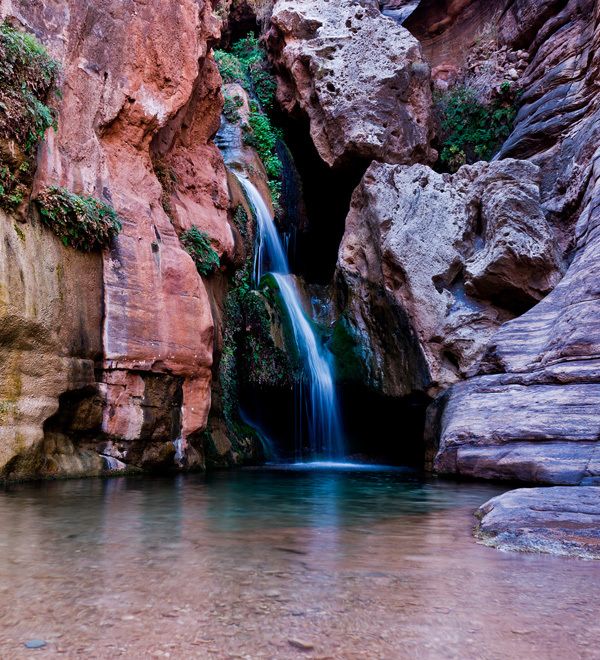 The Grand Canyon Trust accepted an invitation to join Save the Confluence’s campaign to oppose the proposed Escalade development in 2012 and continues to support the grassroots coalition’s efforts to defeat the project. The Save the Confluence coalition, of which Grand Canyon Trust is a part, continues to campaign aggressively against Escalade. Council Delegate Bennett introduced the bill to approve it in late August 2016, triggering a five-day public comment period that produced more than 5,000 comments and signatures by Navajo citizens opposed to the legislation. Only 131 comments were submitted in support of it. Bennett remains the sole sponsor of a bill that requires two-thirds of the 24-member council to pass. Two weeks ago, the Grand Canyon Trust hosted the premier of “The Confluence,” a powerful new film that captures the courage and conviction of local residents in their six-year fight to stop Escalade. As Delores Wilson-Aguirre explains in the film’s opening frames, "The most special place [for us] is at the confluence. That's where we offer our prayers. Whatever is bothering you, you say your prayers, and it's gone. The holy beings, they listen to you, and they take it away, and you become whole again." "We have emerged as others before us from this Canyon to protect, conserve, and preserve the balance of the past and ever changing future from threats like the Grand Canyon Escalade. This proposed resort with a gondola, and riverwalk would scar and alter the landscape of Grand Canyon. For six years we have been toe to toe with these developers and will not back down! We will remain to protect this place which we all have come to love, like those before us in histories past." No to Escalade. No to thousands of tourists. I pray that the Canyon be left untouched so that my grandchildren might see and feel its majesty the way that it was created. Comercialization will destroy the magical feel of this beautiful area. This is a Holy place! Leave it alone!! !